Matt Smith's Lost River Escapade | Warped Factor - Words in the Key of Geek. I've been waiting to see this movie, Ryan Gosling's directorial debut just now released in America, because I wanted to see what sold our dearest Eleventh incarnation of the Doctor, Matt Smith, to risk so much to appear in this critically reviled film. In my attempt to save you money and time... 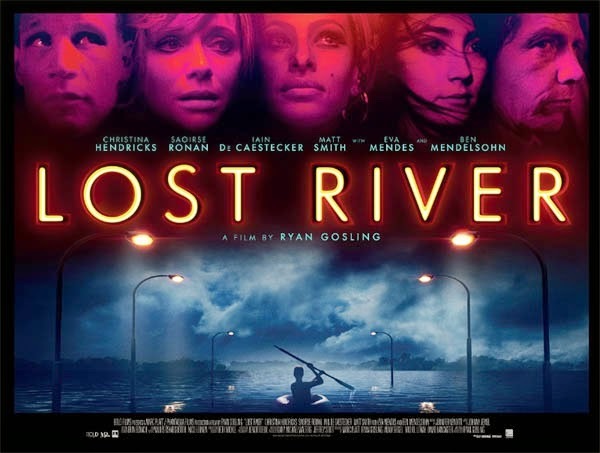 I will be completely honest up front by saying do not waste either to view Lost River. It was not theatrically released because it is, basically, unwatchable. 2. Stilted and awkward dialogue. CHECK. 4. An untrackable, yet obviously indulgent, sound and editing. CHECK. 5. Talented actors matching obviously uncomfortable community actors in a lowest common denominator cast. CHECK. So to us Whovians, here is our beloved Matt Smith risking everything to be a smallish part in a piece of stink! For this, he shed his lustrous locks, carefully crafted persona and legitimacy as a discerning actor to play this Bully. In response to his risk, we were forced to watch an awkwardly premature regeneration (done in a pretty awful wig) as Smith closed his time as the Eleventh Doctor. In the end, Lost River has absolutely no redeemable quality. Not as a film, script, star vehicle or showcase for Smith. It is an ego-driven psychodelic nightmare from a deluded Hollywood star. Yet like a train-wreck, I found myself hypnotized still trying to see what Matt Smith was so keen to do. I wanted to believe in actor Matt, not just the Eleventh Doctor, but clearly as a discerning actor, Smith failed. After seeing his earlier works, reading reviews of others including the London premiere of American Psycho, I don't think we can trust his artistic sense at all. And all this is even before he appears in either Terminator: Genysis or Pride And Prejudice And Zombies. At the end of Lost River I'm left believing Matt Smith was fortunate to get the role of the Doctor. There, he had words and directors that showcased his potential, and as the talented affable man he is Smith rose to the opportunity. On Doctor Who they displayed him, challenged his talent and wrote to his skill. Yet in Lost River, with no guidance, Matt Smith was lost in a passel of people roped in by the name Gosling. Please, please avoid this journey lest you want to lose money and the last of your respect for the Eleventh Doctor, too.